Part two of our Greek feast – check out my homemade pita bread here. This dinner has been on the list since I first began researching recipes for 68 Days of Gourmet. 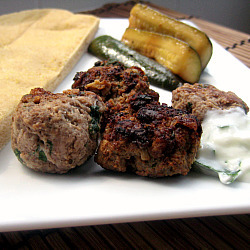 I thought Kefta and Zucchini Kebabs with homemade tzatziki sounded great. Unfortunately, the kebab thing was not happening! I tried to putting these meatballs on skewers but immediately knew that there was no way they would stay on the skewer. They were falling off. I made a game time decision to cook them inside in a skillet and all was well and tasty with no grilling disasters! I think one of the biggest milestones you make as a home cook is the ability to deal with situations in the kitchen that don’t go as planned. I had a lot going on in the kitchen – homemade pita bread, making tzatziki, assembling the meatballs and marinating the zucchini. It would have been easy for me to get frustrated and give up on the dinner but I just decided to make the best of it and cook the meatballs and zucchini on the stove top instead. I made a different kefta recipe last year using this method so I knew it would work out. I don’t blame the recipe for my meatballs not coming together. I forgot to buy pine nuts for the meatballs and don’t know if they might have been a detrimental part of the binding. Regardless, this turned out to be a great dinner. We stuffed our pitas with the keftas and taziki and ate the zucchini on the side. Brandon enjoyed the leftovers in pita sandwiches for lunch. Quick update on fitness recently. 10 workouts in the last 8 days – all yoga, running (!!!) and teaching BodyPump. Overall, I’ve been feeling great but kind of hit a wall today. I’m a big fan of the time change – love having daylight when I get home to run and hang out outside – but it was really tough getting up at 5 to teach BodyPump this morning. I felt so out of it and exhausted all day. Decided just to relax on the couch, catch up with the DVR and make homemade pizza this evening after work. Exactly what I needed. Sometimes you just need to listen to your body and rest! Stir together yogurt, mint/parsley, garlic and salt in a small bowl and chill. Whisk together lemon juice, sugar, salt, pepper and oil in a large bowl and stir in zucchini slices. 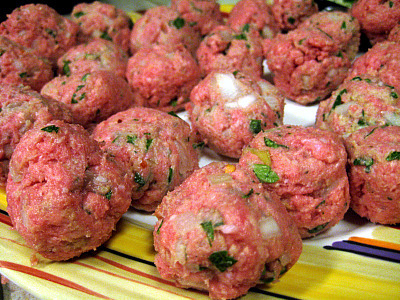 Marinate at room temperature while making meatballs. Cover bread with water in a bowl and soak 10 minutes. Squeeze handfuls of bread to remove as much excess water as possible and transfer to a bowl. Pulse onion and herbs in a food processor until finely chopped. Add mixture to bread along with lamb, salt, spices and pine nuts. Mix with your hands until well blended. Form lamb mixture into 36 balls (about 1 tablespoon each). Prepare grill for cooking over medium-hot charcoal (medium heat for gas). Thread 6 meatballs, 1/4 inch apart onto each of 6 skewers. Thread zucchini lengthwise onto remaining 6 skewers (5 slices per skewer). Cut sides should be on grill, leaving 1/4 inch between slices. Grill zucchini and lamb on oiled grill rack, turning over once, until golden and just cooked through, 4 to 6 minutes. Serve warm with yogurt sauce. Alternatively, saute zucchini and meatballs over medium heat on the stove top (in separate skillets) until cooked through, 6-8 minutes. 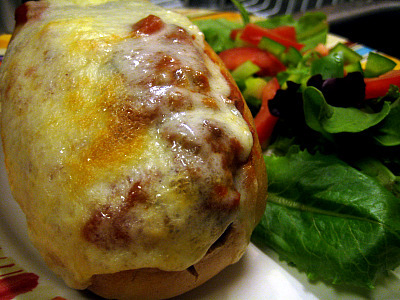 I saw this recipe in The Gourmet Cookbook as I was putting together our menu for the week. I knew this would be a huge hit with Brandon and I haven’t made meatballs in forever. This dinner was surprisingly quick and easy to put together given that you make your own tomato sauce. I put the sauce on to simmer, assembled the meatballs and stashed them in the fridge while I was doing some things around the house. I put pasta on to boil and cooked the meatballs once we were ready to eat. Overall, I would have to say that the meatballs were a definite success but I would use a different sauce recipe next time. 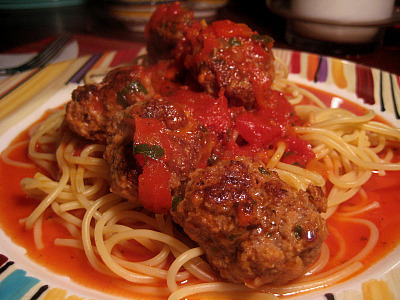 I loved the combination of veal, pork and beef in the meatballs and they held together beautifully. No falling apart while cooking – this could have been helped too by the time they spent in the fridge prior to being cooked. I found the sauce to be a little too thin. At first I attributed this to my laziness, the recipe calls for pulsing whole tomatoes a food processor. I just stuck some kitchen shears in my whole tomatoes and cut them up so they were more diced than pureed. Then I read the reviews on the online recipe and saw that others had issues with the thin sauce too. I think this could be helped by adding a little tomato paste and maybe using crushed tomatoes instead of whole. Or just use your favorite marinara recipe (see my favorite recipe here) and skip this one all together. Also, if you’re big on sauce and serving this over pasta you may want to double the sauce. Heat a medium saucepan over medium heat. Add 1 tablespoon olive oil and add garlic and about 1/4 of your diced onion. Cook for about 5 minutes, until onion softens and becomes transparent. In the meantime, if using whole tomatoes, pulse tomatoes with juices in food processor until chopped. Add tomatoes, oregano, Italian seasoning, splash of wine and 1/2 teaspoon of salt to pot. Simmer uncovered, stirring occasionally, until thickened, about 20 minutes (can simmer longer if necessary). While sauce is simmering, stir together bread crumbs and milk in a large bowl and let stand 5 minutes until bread crumbs have absorbed milk. Add meat, rest of onion, 3 tablespoons parsley, red pepper flakes and remaining teaspoon salt. Blend with your hands until just combined (do not over mix). Form 2-tablespoon amounts into meatballs. You should have about 20. Heat remaining 2 tablespoons of oil in a 12-inch heavy skillet over medium high heat until hot but not smoking. Carefully add meatballs and sauté in 2 batches, turning occasionally, until well browned, about 5 minutes. Transfer to tomato sauce using a slotted spoon. Simmer meatballs, covered, stirring occasionally, until cooked through, about 5 more minutes. Serve over pasta and sprinkle with remaining 2 tablespoons parsley.